From a military family. Chief of Staff of 2nd Armored Division (Hell on Wheels) in WWII and Deputy Commander of 1st Cavalry Division in Korea. Grandson of William Edward Birkhimer. 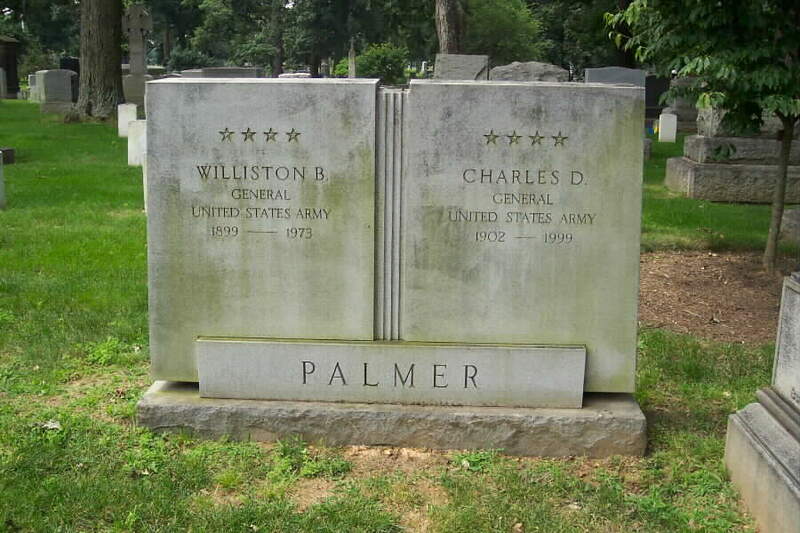 Brother of Williston Palmer, and they share a joint headstone in Section 1 of Arlington National Cemetery. His mother, Edith Birkhimer Palmer (July 1, 1878-November 11, 1903), is buried with him. She was the only child of William Edward Birkhimer, and the mother of both Charles Day Palmer Jr., Williston Birkhimer Palmer. 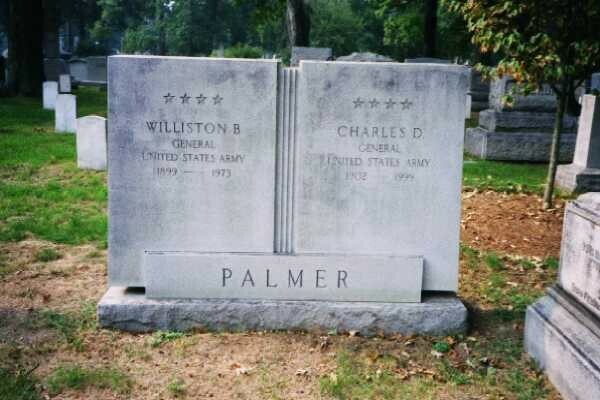 Charles Day Palmer, 97, a retired Army four-star general who was a heavily decorated combat veteran of World War II and the Korean War, died of cardiac arrest June 7, 1999 at his home in Knollwood, the Army retirement home, in the District. When the United States entered World War II, he was a major stationed in the British West Indies, where he was working on anti-submarine warfare projects and involved with the logistics of this country establishing bases in the British-ruled islands. In 1942, General Palmer joined the Armored Force in the United States, then in 1944 went to Europe as chief of staff of the elite 2nd Armored ("Hell on Wheels") Division. He held that post as the division participated in the Normandy invasion, the breakout at St. Lo and the battles across France and the low countries to the Siegfreid Line. In October 1944, he took part in the invasion of southern France as chief of staff of the VI Corps, holding that post as the corps drove through France, across the Rhine and into Germany and Austria. Along the way, he received a battlefield promotion to brigadier general. When the Korean War broke out in 1950, General Palmer was stationed in Japan with the 1st Cavalry Division. He served as the division's artillery commander and then as its commander, with a battlefield promotion to major general, while participating in six Korean campaigns. His later posts included those of commanding general of the Sixth Army in California and deputy commander of American forces in Europe. After retiring from active duty in 1962, he settled in Washington and spent about seven years as a military consultant with the Research Analysis Corp.
General Palmer's military decorations included three awards of the Distinguished Service Medal and two awards of the Silver Star, the Legion of Merit and Distinguished Flying Cross. He also held the Bronze Star and the Air Medal. Over the years, he had served as a director of both St. Alban's School and the Retired Officers Association. He had been a member of the Chevy Chase and Army & Navy clubs. General Palmer, who was born in Chicago, graduated from Western High School in Washington. He was a 1924 graduate of the U.S. Military Academy at West Point. Survivors include his wife, the former Eugenia Kingman, whom he married in 1954 and who lives in Washington; a son, Charles III, of Concord, Massachusetts. ; and three grandsons. 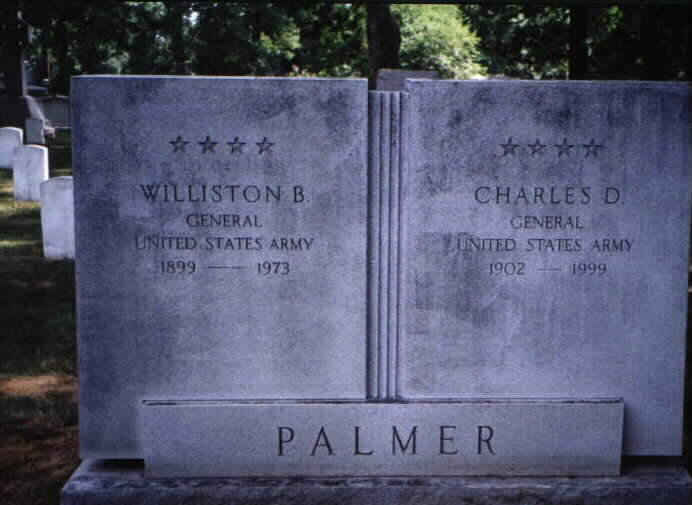 On Monday, June 7, 1999, GENERAL CHARLES DAY PALMER, husband of Eugenia K. Palmer; father of Charles D. Palmer, III of Concord, Massachusetts. He is also survived by three grandchildren. Services will be held at Fort Myer Chapel on Thursday, June 24, 1999 at 9 a.m. Interment Arlington National Cemetery. In lieu of flowers, contributions may be made to the West Point Fund, St. Alban's School or Army Distaff Foundation. Arrangements by JOSEPH GAWLER'S SONS. 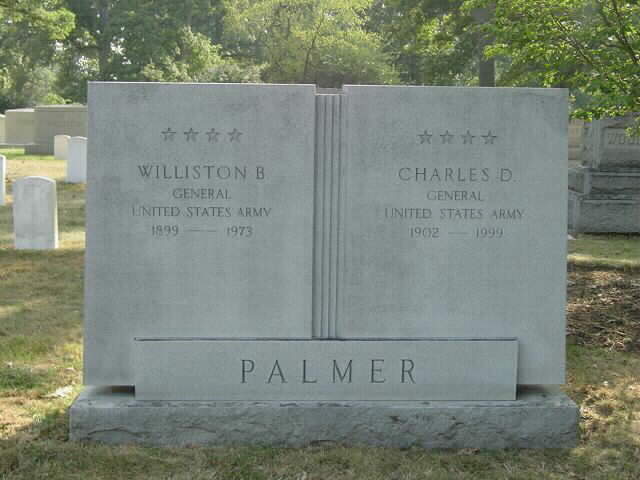 General Charles Palmer Died in Washington D.C. on June 7th 1999. As you know General Palmer was with the 1st Cavalry Div as Division Artillery Commander. Here is the article from the Washington Post. "Charles Day Palmer, 97, a retired Army four-star general who was a heavily decorated combat veteran of World War II and the Korean War, died of cardiac arrest June 7 at his home in Knollwood, the retirement home, in the District. In 1942 General Palmer joined the Armored Force in the United States, then in 1944 went to Europe as Chief of Staff of the elite 2nd Armored ("Hell on Wheels") Division. He held that post as the division participated in the Normandy invasion, the breakout at St. Lo and the battles across France and the low countries to the Siegfreid Line. In October 1944, he took part in the invasion of southern France as Chief of Staff of the VI Corps, holding that post as the corps drove through France, across the Rhine and into Germany and Austria. Along the way he received a battlefield promotion to Brigadier General. When the Korean War broke out in 1950 General Palmer as stationed in Japan with the 1st Cavalry Division. He served as the division's Artillery Commander and then as its Commander, with a battlefield promotion to Major General, while participating in Six Korean Campaigns. His later post included those of Commanding General of the Sixth Army in California and Deputy Commander of American forces in Europe. Over the years, he had served as a director of both St Alban's School and the Retired Officers Association. He had been a member of the Chevy Chase and Army and Navy Clubs. Survivors include his wife, the former Eugenia Kingman, whom he married in 1954 and who lives in Washington; a son, Charles III of Concord, Massachusetts, and three grandsons." WASHINGTON, June 14, 1999 – General Charles Day Palmer, the four-star General in charge of American forces in Europe in the early 1960’s, died on June 7. He was 97. General Palmer died in Knollwood, the Army retirement home in Washington, said his nephew, Michael Neill. The cause was heart failure. General Palmer, whose military awards included the Silver Star, the Legion of Merit and the Distinguished Flying Cross, saw combat in World War II. He served as a Major in the British West Indies and fought in the Japanese attack on Pearl Harbor. In March 1944 he became Chief of Staff for the Army’s Second Armored Division and participated in the Normandy invasion. Seven months later, he was transferred to the south of France as Chief of Staff for the Sixth Army Group, and saw action in Alsace, in the Rhine crossing and in the attack across Southern Germany and Austria to the Brenner Pass. He was promoted to Brigadier General. He served in a total of six major campaigns in World War II. In 1960, General Palmer served in Korea as commander of the First Cavalry Division. By 1959, he replaced his brother, General W. B. Palmer, as the general overseeing American forces in Europe. General Palmer is survived by his wife of 45 years, Eugenia K. Palmer, of Washington, D.C., his son Charles Day Palmer 3rd of Concord, Massachusetts, and three grandsons, Daniel, Robert and James.